I have personally experienced the pain after updating plugins and WordPress core that my website just died.. Im sure you have seen the error 404, 502, 503, 504, unable to connect to the database, CSS file goes missing after an update. Trust me, i have seen these uncountable amount of times. To counter this problem, what do we do? we manually create a clone site (ftp download and upload, create new folder) or keep a copy of it in the local drive. Then, we are able to test the outcome and do an update if everything looks good. However, that does not solve the error problem entirely, due to different set of configuration or settings, sometimes something or somewhere will possibly go wrong. So, If we have to perform tasks on our WordPress website that involves risky updates and checking change, it is best to create a Clone of your WordPress site. In this way, you have a playground environment to set whatever you wish to test. A place completely isolated from the production site. Alright let’s get on, on how you can create a clone WordPress site. A Clone of your WordPress site is a live and exact replica of your current WordPress site. With your clone WordPress site, You are able to test and test as if its a live site. Bear in mind, it is not only the exact replica of your website, its the exact replica of the whole server, service configuration and infrastructure where you website is hosted on. This is one of our greatest feature that we are very proud of. Not all cloning features out there does this level of deep replication like wetopi. When do we clone a WordPress site? If we need to do an update to WordPress, plugins or templates, … better to do it on a clone site first! If we want to experiment with a new templates, plugins or just to play around with it, …it’s highly advisable to experiment on a clone site, so we do not disrupt other users, nor mess up our WordPress site or leaving traces of unwanted codes. If we need to urgently solve a problem: We can create a couple of clones and ask our developers to assist us. 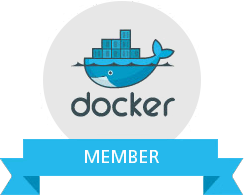 Both extra cloned servers can work in parallel and in isolated environment and our developers can try whatever they need without interfering each other or breaking our production site. How to clone your WordPress site? 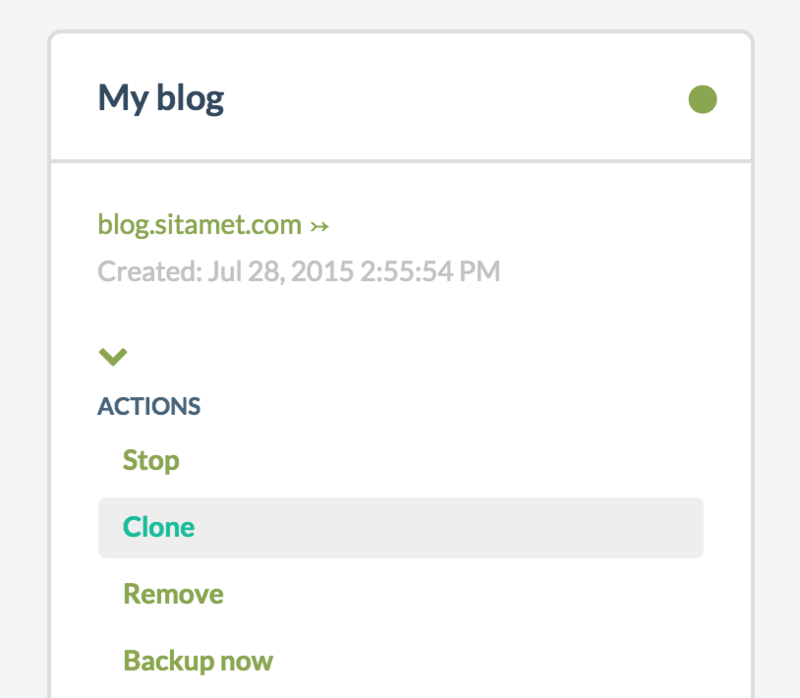 There are several ways to clone our site: Xcloner, Duplicator, WP CLone, etc. They are plugins that facilitate the task, but their weakness is that they require some skill and time. Fear wins and we postpone the task. In wetopi, to clone a WordPress site, is a task of one click and a few seconds. Time or technicalities are no longer an inconvenience! There is no excuse! wetopi clone system is so easy that we’ll carry out any risky task on a clone. 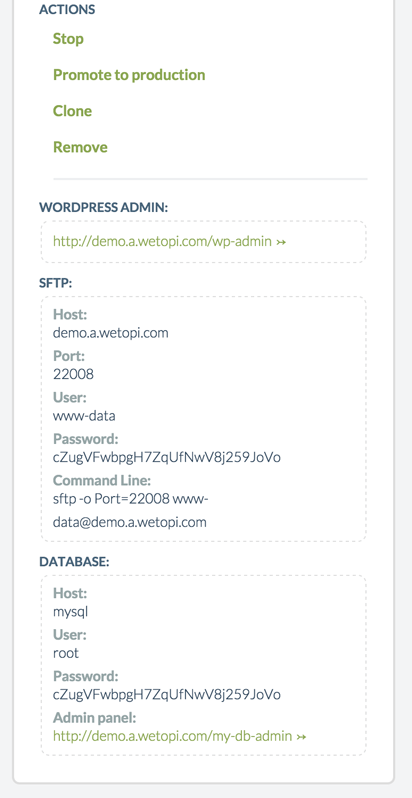 Each wetopi account has three servers. The one called “production” is our web “live” production site. The others are “extra servers” that can be utilised to clone your site. (note: access data and users of the WordPress administration space will be preserved). A clone can be moved to a production environment. So, you have a great success in updating your site template or plugins, and you are happy with the outcome. no bugs and ready to rock the world wide web? We have not wasted our time with manually recreating the duplicate site or testing or destroying the production site. With wetopi, we can Promote a clone to a Production in a few seconds. it then can start serving our main domain (the one that we have assigned to the site).